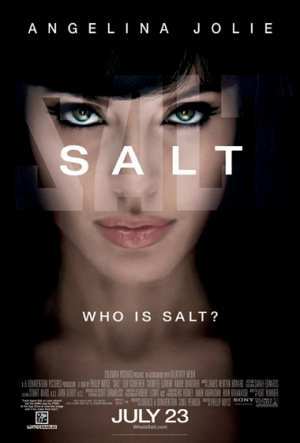 "Salt" is the copyright infringing film starring actress, Angelina Jolie, as a CIA operative named "Evelyn Salt" who is accused of being a Russian spy. When she is wrongfully accused of betraying America, Salt goes on the run, with the entire CIA coming after her. "Salt" is a violent, sadistic, xenophobic, salacious, convoluted film bearing gratuitous violence, stereotypes and hatred that the original writer never intended. Sony put this film together in such a poor, tacky and corny manner, that so many elements, from the script to costumes/hair, were substandard.